KarmaQuest invites you to travel through Burma’s stunning cultural landscape, visiting world-class heritage sites including Bagan, with its 2,500 stupas spread like jewels on the banks of the Irrawaddy River; Yangon, with its magnificent, gold-embossed Shwedagon Pagoda; and the fascinating water world of Inle Lake, where you’ll glide in dug-out wooden boats amidst floating vegetable gardens and to a local farmers market on the water. We’ll also take you beyond the deservingly popular visitor sights to villages where ethnic peoples carry on centuries old textile making and weaving traditions. We’ll travel by foot, boat, jeep, bus and plane; stroll through colorful markets; join worshippers at Kyaikhtiyo (Golden Rock) and Malawmyine, a center of Buddhist worship and history; and give you time to explore on your own. The trip is scheduled to take in a lively New Year festival for the Kayin people, Burma's second largest minority ethnic group who celebrate joyously with music, song and dance -- a rare treat! The journey begins and ends in Yangon, reachable by flight from Bangkok and other Asian hubs. Pre- and post-trip extensions to Thailand, Laos, Cambodia, Vietnam, India and Nepal are available. This is an opportune time to visit Burma in terms of the cooler weather and the chance to witness a newly found democracy unfold. Day 1: Fly to Yangon: Formerly known as Rangoon, Yangon is a relatively quiet and charming city. Count your blessings as you stroll with hundreds of Buddhist practitioners around the magnificent Shwedagon Pagoda, the most revered Buddhist temple in Burma. Day 2: Yangon: We’ll spend the day seeing the sites, including Botataung Pagoda, Pansodan Street with its colonial buildings and sidewalk markets, Wahdan jetty, a lively shipping dock, the National Museum, and China town. Day 3: Mawlamyine and Kawtgoon Cave: From Yangon, we’ll drive eastward to Mawlamyine, stopping at the spectacular Kawtgoon Cave to see the detailed wall carvings of Buddha (photo left). We’ll continue on to Shwe Yin Myaw pagoda by the Thanlwin River, and a bustling jetty and city market. Time permitting, we will climb Zwekabin Mountain on a pilgrim’s staircase. Day 4: Celebrating Kayin New Year in Hpa An: Today we’ll join the Kayin community for its New Year celebrations in Hpa An, capital of the Kayin State. The Kayin people wear their traditonal clothes of woven tunics over red longyis on this day and hold colorful dance contests along with other joyous events. Day 5: Golden Rock: Traveling to one of the most important Buddhist pilgrimage sites in Burma, we’ll drive to Kyaikhtiyo and ascend the steep hill leading to the amazing holy site known as the ‘Golden Rock’. The large boulder appears to be delicately balanced on the edge of a cliff, supposedly held in place by a hair of the Buddha. We’ll overnight at Kyaikhtiyo. Day 6: Return to Yangon: Wake early to enjoy a beautiful morning sunrise at Kyaikhtiyo before departing. Heading toward Yangon, we’ll visit a pagoda even taller than the Shwedagon: Shwetelyaung, the most life-like of all reclining Buddhas; and four 30 meter high sitting Buddhas. Day 7: Fly to Bagan, Drive to Mt Popa: The flight into Bagan provides a bird’s eye view of this amazing architectural landscape. Thousands of clay and stone stupas (temples) built during the 11th to 13th centuries by Hindu and Buddhist rulers stretch across the vast plains. Drive through countryside to Mt. Popa, renowned for a nearby volcanic plug that holds Taung Kalat Monastery at its summit. Overnight in a lovely resort near Mt Popa. Day 8: Bagan: Drive back to Bagan, stopping to see how toddy (homemade liquor) is made from palm sugar. After checking into our hotel, we’ll visit a select handful of these magnificent pagodas and temples. Some contain the original statues and frescoes, as well as impressive stone arch ways and intricate sandstone carvings. We’ll also visit a lacquer workshop. Overnight in Bagan. Day 9: Bagan: We’ll visit the colorful Nyaung U market, and travel to villages where weavers use handlooms to create household fabrics and make cotton thread in the traditional way. We’ll take a horse cart ride and climb a stupa for a panoramic view over the pagodas. 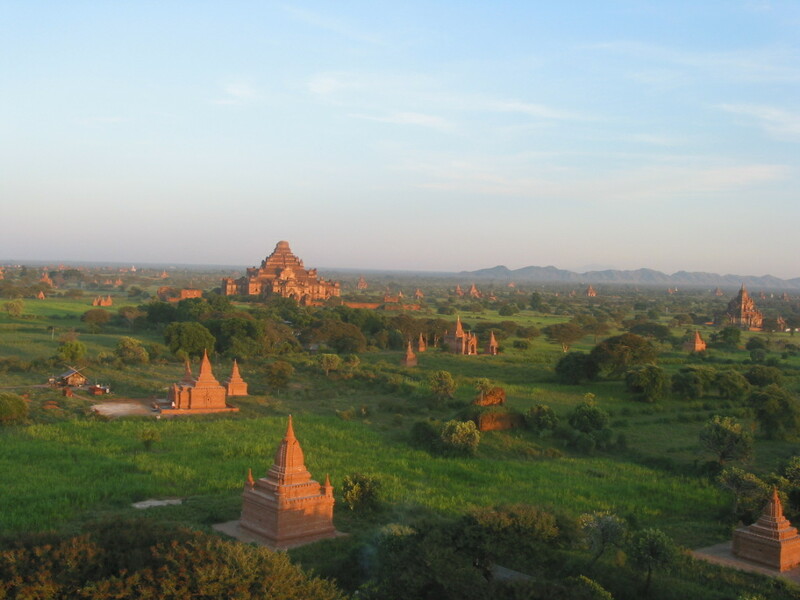 Optional: early morning hot air balloon ride for a stunning aerial view of Bagan. Bicycling is also a fun way to see the market and temple sites. Day 10: Travel to Inle Lake: We’ll fly and drive to Inle Lake where ethnic peoples live in homes built on stilts and farm on floating gardens. We’ll travel by boat to the open-air market, visit a Buddhist monastery and tour a village where cotton longyis (sarongs) are woven. Overnight in a deluxe hotel on the lake. Day 11: Inle Lake: Today we’ll travel in a long boat to a local market (market schedule permitting) and then up a small creek to the village of Indein, where Padaung peoples live. A short walk through a clustering of ancient carved pagodas leads to a monastery on the hill. Return to the lake and glide amongst the floating gardens and villages, visiting centuries old monasteries and observing local artisan skills such as silk weaving, silver smithing, and other cottage industries. 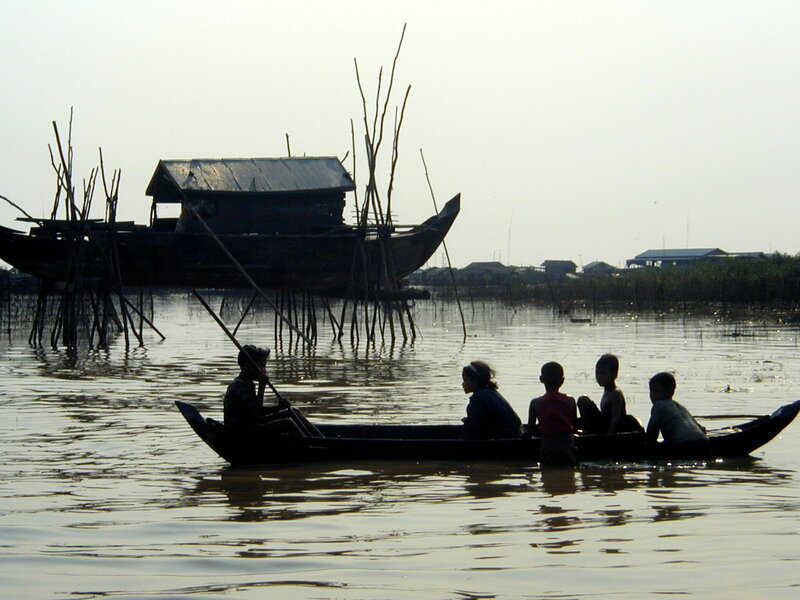 Day 12: Inle Lake and transfer to Yangon: We’ll drive to Heho for a flight to Yangon. Flight times permitting, we'll spend a couple of hours at the famous Scott Market -- whether a shopper or not, this collection of hundreds of small shops selling everything from household essentials to arts and crafts under one roof is a menagerie of colorful fascination. 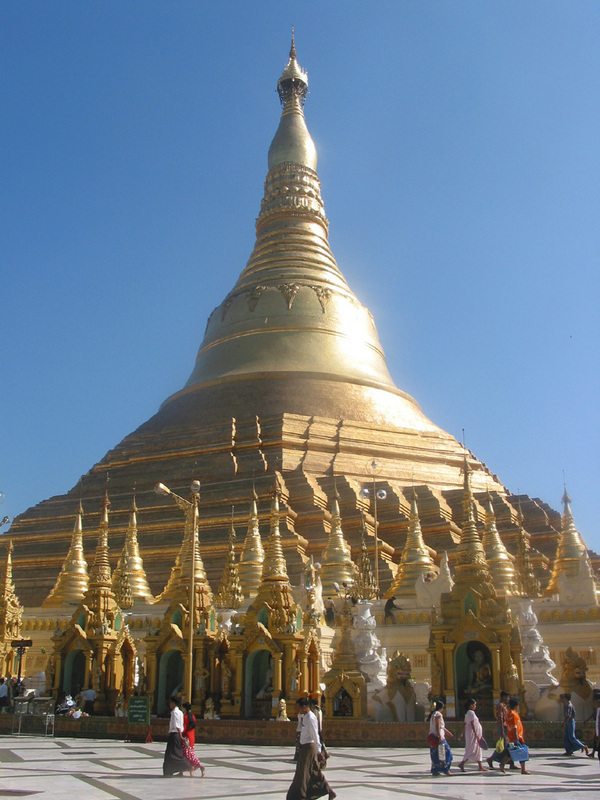 Day 13: Depart Yangon: Enjoy free time in Yangon until it is time to transfer to the airport for your departure flight. In keeping with KarmaQuest’s commitment to responsible tourism – tourism that benefits local communities and supports conservation of the natural and cultural environment in the places we visit – we invite your donation to help benefit the disadvantaged women and children of BurmaPlease inquire about this and other ways that you can help.